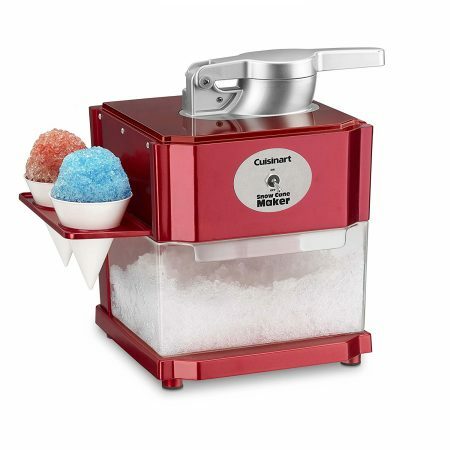 But for great snow cones, you need a great snow cone maker. So, we’ve researched the best models on the market, and curated them down to this list of only the best. We’ve ensured our recommendations are worth every penny, but also tried to include a model for everyone: from experimental kids who just want to give snowcones a try, to lifelong snowcone fanatics. There’s a choice here for everyone. If you’re not sure which type of snow cone maker would be perfect for you, don’t worry. We’ve included a quick guide to the different types near the end of this article. Give it a read, and we’ll help you realise which aspects are most important to you. That way, you can find your perfect snow cone maker. If you want a quick answer, we’ve got two top recommendations for you. 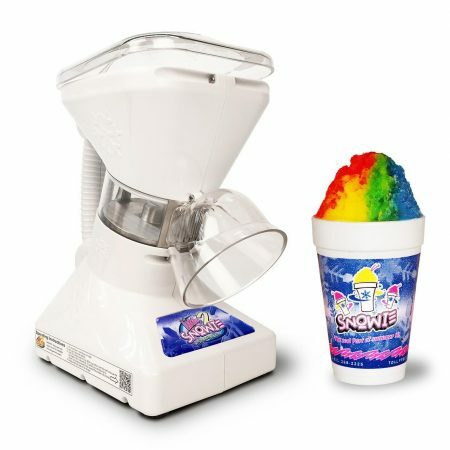 If you’re looking to have some fun making snow cones with the family, then we think that the Nostalgia SCM502 is perfect for you. It’s like a mini festival stand, and always goes down an absolute treat with everyone. The snow it creates is good quality, and being able to stockpile it in the transparent container is great for serving lots of people at one time. It’s a great all-rounder with a fantastically lovable looks factor – and it doesn’t break the bank, either. Check it out below, it’s at our #1 spot on the list. But if you’re a die-hard snow cone lover, then you will absolutely love ‘Little Snowie 2’. Snowie isn’t cheap, but boy does he tick every single box we could ask for. Compact size, incredible build quality, super-fast production rate, and fantastic ice quality. With also has an input funnel big enough to hold ice blocks, you can make even finer snow cones. Apart from the price tag, everything about this model is absolutely top notch – it’s all that a snow cone fanatic could ask for. Check out Snowie on the #2 spot in our list below. Bringing back the nostalgic fairground feeling, this model never fails to be a big hit with kids and adults alike. At first glance, this snow cone maker looks like one of those gimmicky models that are never as good as they look. Well, we’re not afraid to say this one definitely proved us wrong. Atop the beautifully quaint exterior lies a solid ice grinder, which churns hard ice cubes into soft and fluffy snow. It’s easy to use, with a safety lock on the lid for any experimental kids. We were so surprised at how well this model works. It’s so rare to have an appliance that looks this great, but actually performs – and it’s fast, too. As long as you’ve got a supply of ice cubes, you’ll have enough snow to keep every pair of little hands happy. Considering that all of the above comes at a great price, compared to the competition, this Nostalgia model really is the complete snow cone package. We love this model. It looks the part, makes great ice, and is easy to use. While it’s a ton of fun for kids, it’s also a lovely reminder of the ‘fairground feel’ that makes snow cones that extra bit special. Which, we think, is priceless. Snowie may be 'little', but he packs a real punch. We don’t know why they’ve given this model such a cute name – because it’s a mini powerhouse. 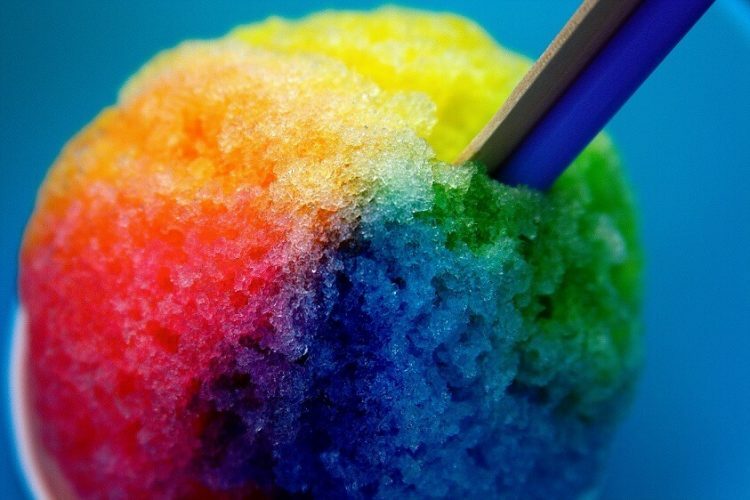 Perfect for real snow cone lovers. If you eat more ice than you drink water, this will be your new best friend. While it is a home appliance, Little Snowie has passed the tests for commercial certification. That means it’s powerful motor and high quality cutting blade are guaranteed to last. Snowie will keep family and friends happy for years to come. It’s also super easy to use. It takes ice blocks as well as cubes, which naturally gives you a much better snowcone thanks to the blade having a flat surface to cut from. The ice shoots out directly into your cup or cone of choice. It takes just seconds to fill a 16oz container with deliciously fine cut snow. The only real downside to Snowie is the price. But if you absolutely love snowcones, it’s more than worth it. We think it’s worth paying for quality when it comes to things that you love, and you’ll definitely get your money’s worth with this model. It’s important to note that the extra money isn’t just going towards a bigger size. Little Snowie is true to it’s name, and is genuinely very small and compact for the amount of power it packs. The quality instead goes into the parts and production, which are simply outstanding. A price that not many would pay for a snowcone machine. But for those that absolutely love their fluffy ice drinks, this model is the holy grail of snowcone makers. Small, powerful, fast, and easy to use – every aspect has been refined to near perfection. Being commercially certified, it’s also guaranteed to stand the test of time. If you’re in the market for the ultimate snow cone machine to use at home, you can’t get much better than this. Yep, an official Disney snow cone maker! 5 points if you can name the movie! 10 points if you’ve been forced watch it over a dozen times..
There’s not been a bigger hit with kids than the movie Frozen, and this Disney-official snow cone maker is perfect continuing that fun (and freezing) feel. In terms of snowcone quality, Olaf does a fine old job. 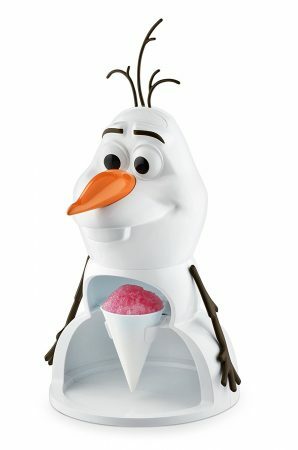 By being able to use ice blocks with the included molds, you can get a ‘closer shave’ and a softer snow cone. But ice cubes straight from the freezer work just fine. It’s nice and easy to keep the kids involved in the snowcone creation process, too. The simple operation is activated by just pushing down on his head, once you’ve got the ice loaded in there. A fantastic model for kids. We love how Olaf can be kept together as a whole snowman when not in use, and is simple to get him ready to make snow cones. If you’ve got a few young Frozen fans around the house who would love making their own icy creations, Olaf will keep them endlessly happy. The cheap price (which is rare for official Disney products) also means that he’s not huge hit to the wallet. Hawaiian are ice specialists, and their cheaply priced snow cone machine is no exception. Hawaiian were named as the top of our ice shaver post, and they’re still running strong with this S700 Snow Cone model. Sticking to a similar recipe for success – using a simple white design, low price, and making great ice – they’ve easily made it into our top 5 list. This model is great thanks to it’s simplicity. Just put ice in the top, and hold a bowl or a cone to catch the snow. Job done. 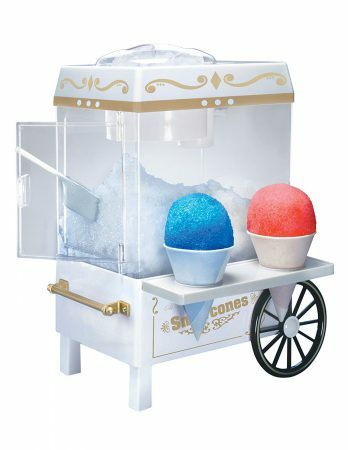 While the exterior is simple white plastic, it allows for one of the lowest prices for a snow cone model, which can still produce high quality snow. It’s easily detachable, too. No need to worry about storage when it’s simple to take apart and fit snugly into small cupboard space. Prefer your ice extra fine or coarser than normal? The cutting blade is easily adjustable via two screws, meaning you can get your snow cone just how you like it. Our only complaint is that the model isn’t the fastest, and can be quite loud – even for an ice grinding machine. That said, we think this is more than balanced by the cheap price, ease of use, great design, and great quality of ice. Low price for great ice! A simple and easy to use model this is a great package at a great price. Hawaiian have stuck to their guns with a model that produces great quality product without the use of expensive materials. It does have drawbacks in terms of speed and noise, but every other box that we look for in an appliance like this has been ticked. It’s a great all rounder, and would be a perfect pick-up if you’re just looking to play around with making some delicious snow cones at home. The ice bucket slides out for easy access. This model is a joint-project between two companies; Cuisinart and Waring. The base design used by both companies is the same, just with their own personal branding and tweaks applied onto each version. Similar to the Nostalgia model at the top of this list, this snow cone maker pours it’s shaved ice into a bucket. Once you’ve made all the snow you want to use, it’s easy to slide the bucket out and scoop to your heart’s content. We like this better than the ‘door’ that needs opened in the Nostalgia model. The slide out bucket also means that it’s super easy to clean, and we think that the whole design looks great, too. There is one thing to note, however: that the design is almost fully plastic (yes, even the metal-looking handle!). Considering that this model is priced quite high, we would expect a more quality finish when spending that much. However, that’s our only real gripe with the machine. If plastic doesn’t bother you, it’s an fantastic machine that makes great snow cones, with easy access via the sliding bucket..
A great product, but we’re not particularly happy with the plastic exterior. Plastic is well and good, but it’s not right to make it look like metal in pictures! Beyond that, however, the model itself is still quality enough to make it into our top list. It’s easy to use and easy to clean, especially with the slide-out bucket. The snow cones are soft and high quality, and we think the looks are great, too (despite the plastic!). Need trouble knowing which snow cone maker would be perfect for you? Don’t worry – we’ve got you covered. Choosing an ideal appliance can be tricky, especially when there’s so many options out there. One way we’ve found to simplify this is by understanding what the manufacturers try to focus on when they design these products. The main aspects that change from one model to the next are included below. Try to spot which are the most important to you. Once you know that, you can find the model which is the best at doing that aspect specifically. So for example: if you want great ice quality and production speed, but price isn’t too important, check out Little Snowie 2. 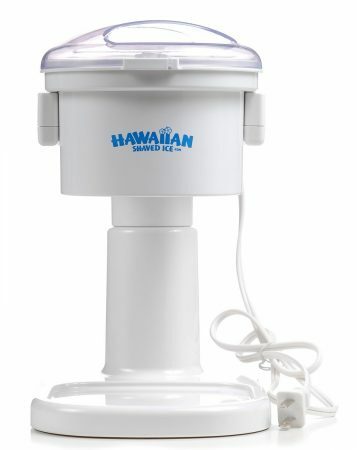 But if you’re looking for a cheap snow cone maker that is easy to use, the Hawaiian model might be your model of choice. Snow Quality – A bit of an obvious one, we try to highlight the general snow quality you get from each model. Closely tied to build quality, you will also get better quality snow if the model takes ice blocks, as well as ice cubes. Build Quality – The quality of the parts that make the model. Normally the biggest influencer on the model price, you’ll typically find more plastic on lower quality models, and more metal parts on a higher quality appliance. Great build quality means better ice, and a longer lasting model life span. Storage – Whether the snow goes directly into a cup or cone, or if it gets stored in a contained to be scooped. While the first approach may be faster for one cone at a time, having a whole bunch of snow ready to go can be great for serving a whole bunch of excited kids at once. Production Rate – How quickly the snow is made. Generally based on build quality, it’s important that the model grinds quickly and efficiently. A torturously slow production rate is the last thing anyone wants! Looks – Different manufacturers go for different looks with their models. See if you can see what they’re going for. The model could be targeted at kids, at pure ice-shaving efficiency, or even just blending in with a modern kitchen. Price – The all important price tag. Generally based on the all of the aspects above, the price for snow cone makers does generally reflect their quality. That being said, there’s nothing wrong with grabbing an all-rounder model for a summer, if you just want to experiment with snow cones and have fun with the kids. All of the models on our list work really well, it’s just the die-hard snow cone fans that will really see the difference of the Little Snowie vs. the cheaper models. When it comes to snowcones, there’s a vast range of people who love them. From kids, to self-proclaimed “ice-aholics”, to anyone who just wants to recreate these sweet fairground treats at home. We hope that our top list has let you find a model that’s perfect for you. If none of them have caught your eye, try checking out Amazon’s bestseller list. While there are other choices out there, we really do recommend each and every one of these models that we’ve curated down into this top 5 list (even though we nitpick from one model to another!). Want to make the perfect homemade snow cone? This page is a fantastic guide to creating your own snow cone syrup. Or how about some creative snow cone ideas to try? Find interesting recipes and ideas on Pinterest. How about an alternative to snow cones? There’s also ice shavers, which we’ve covered fully in our post here. They’re a great alternative, not so snow-cone focused but also being perfect for slushies, cocktails, and smoothies.